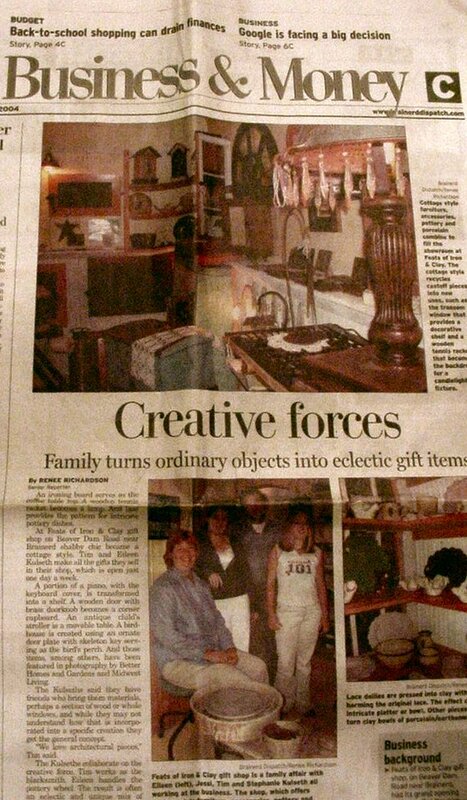 Family Turns Ordinary Objects into Eclectic Gift Items. An ironing board serves as the coffee table top. A wooden tennis racket becomes a lamp. And lace provides the pattern for intricate pottery dishes. At Feats of Iron & Clay Gift Shop on Beaver Dam Road near Brainerd, shabby chic became a cottage style. Tim and Eileen Kulseth make all the gifts they sell in their shop, which is open just one day a week. A portion of a piano, with the keyboard cover, is transformed into a shelf. A wooden door with brass door knob becomes a corner cupboard. An antique child's stroller is a moveable table. A bird house is created using an ornate door plate with skeleton key serving as a bird's perch. And those items, among others, have been featured in photography by Better Homes and Gardens and Midwest Living. The Kulseth's said they have friends who bring them materials, perhaps a section of wood or whole windows, and while they may not understand how that is incorporated into a specific creation they get the general concept. "We love architectural pieces," Tim said. The Kulseth's collaborate on the creative force. Tim works as the blacksmith. Eileen handles the pottery wheel. The result is often an eclectic and unique mix of familiarity with objects in surprising forms as they turn a metal sewing machine pedal into a shelf. The gift shop includes small pieces of jewelry, both delicate and solid looking pottery dishware with large furniture pieces. The Kulseth's say shoppers may be looking for that one conversation piece. Things started with an old door that Tim turned into a coat rack with hooks and legs. "Everybody loved it but we didn't know what to do with it," he said. On a trip to Edina, they saw some similar items in a shop named Casa Bella. When they brought the door, the shop wanted more. They knew the shabby chic style was a hit. Now their style has meshed more with the cottage trend. Cottage style is a mixed cast of furniture and accessories once found in comfortable cottages of vacation time, where the decor typically was made up of leftovers from a family's full-time residence. Now cottage style, which has inspired books, articles and magazines, often comes from recycling furniture and accessories from family attics or road side sales. The original use is often altered in the bargain, hence the ironing board coffee table. "We are major recyclers," Tim said. " We see the beauty in something people threw away. A lot of the times it is retaining the history. "You can see them back at Grandma's house again," he said of customers when they react to certain pieces. "I think people enjoy our stuff because it has a sense of history and nowadays you don't see so much of that any more." Nearly forgotten patterns of linoleum became part of a birdhouse. A clothes chute frame in a door became a cabinet front. The customer who bought the piece seemed as hooked on its sentimentality as anything. He told the Kulseths the clothes chute was just like one he used to play with at his grandmother's house. "We love creating something out of what's in front of us," Eileen said. And they said material often comes to them without a clear idea of how it can be used until it becomes matched with a request. It also can work the other way around. Years ago, when they needed old stairway spindles for a birdhouse and were down to the last one, Tim happened to stop by a collapsed house while driving near Garrison. In the corner where a wall had fallen was a pile of spindles from a disassembled staircase. Eileen has worked with pottery for decades. She volunteers at the art department at Mississippi Horizons. In addition to creating objects for the gift shop, she offers pottery demonstrations and lessons. A customer may work with help on a project for two hours using the pottery wheel or by hand for $28.00. Other ongoing lessons cost $15.00 per hour. Pottery studio students maybe those who remember their high school or college art work and want to try their hands at it again. The gift shop serves as a bridal registery for couples who want accent pieces. The Kulseths also make three dimensional handmade tiles and do custom pottery. They create baby handprints and footprints in clay. Future projects include garden gates with scenes on them. Custom cottage style pieces are available for people who may want to retain memories of an old cabin or home by incorporating pieces of it into their decor. They have been asked to put a window from just such an older home into a coffee table. Other pieces were created from old railroad cars. "We've made furniture out of just about everything," Tim said. Gift shop costs range from $4.50 for small pottery pieces to $480 for larger furniture. The piano shelf, for example, is $225. Pottery lace ranges from $10 to $50. Works from Feats of Iron & Clay are found in Bethany Book Store in Baxter and at Rustica Home Furnishings and Great Furniture & Carpet, both in Crosslake. Eileen takes the lace doilies and presses them into clay and reshapes the piece. She has worked with heirloom lace pieces "the lace is not damaged in the process" and creates platter dishes and small bowls. Pieces are ovenproof and microwave and dishwasher safe. Eileen signs pottery pieces and includes a small fish to note the effort does not come without God's help. The Kulseths said they push themselves during the week to have something new in the gift shop each week when it opens on Saturdays. The business is open 10a.m. to 4p.m. and by appointment. They also have lots of ideas for additional pieces, which are stored in a drawer after being conceived and recorded on restaurant napkins. "Everything happens on napkins in our family, " Jessi said and laughed.